Colby Ridge Popcorn has been popping gourmet popcorn since 1931. At Colby Ridge, we're obsessed with making sure every one of our kernels is the best popcorn you've ever tasted. Our signature quality comes from only using the finest ingredients at every step of the process, starting with the corn. Luckily, we're in the heart of the Corn Belt, so we know the care and attention only small, family farmers can put into every ear of corn. Our time-tested family recipe secrets are not to be trifled with either. We take the time to guarantee our flavors are infused in every bite, because we know you'll notice. Colby Ridge popcorn is always popped fresh, and packaged to lock in the flavor. So go ahead, indulge! We won't tell anyone. Who would have thought that a little store near the Nebraska State Capitol in downtown Lincoln would have blossomed into what it is today? Colby Ridge has grown from that original little store that was opened in 1931 by "Pop" Charles Miller, to a number of commercial locations, a national catalog business, and an on-line popcorn/gift shopping experience. All of the Colby Ridge business today is an expansion of that original store, including many of the original recipes. Colby Ridge has built upon all the same secrets to freshness, flavor and the highest quality of service available, that were born in that original location. Conner's Architectural Antiques has specialized in architectural artifacts and salvaged building items for over 40 years. The extensive inventory includes hundreds of light fixtures, stained glass windows, fireplace mantles, terra cotta ornaments, wrought iron gates and fencing, woodwork, trim, flooring and over 600 doors. Come and browse the showrooms. With latest trends for re-purposing and up-scaling items of all types, Cool and Collected Antique Mall is the place to shop. 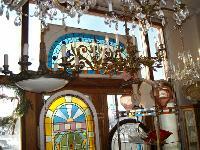 Cool and Collected not only specializes in antiques, you will find vintage, retro, primitive and mid-century items. It's not like any other antique mall in Lincoln! Cooper & Co. Home + Gift is a sister store to The Basket Bunch, a Lincoln home decor and gift shop since 2001. Cooper & Co. Home + Gift offers larger accent furniture, home decor accessories and gift items. Cooper & Co. Home + Gift also offers interior design services where we come into homes and help with the finishing touches to any room. With over 60 years in business, Cornhusker Billiard Supply/Barstool and Patio Gallery, is your source for gameroom and family fun. With a wide selection of games to choose from your sure to find fun for the whole family. We also offer a variety of quality made barstools and patio furniture to choose from. Cycle Works was started in the summer of 1981 with 5 bikes and $300 in accessories in the shell of a former car wash. Since then we have expanded to our present location across the street with more than 1000 bikes and a few more parts and accessories. We have been able to grow by following one principle, "Quality, Service and Selection is Everything!" We maintain a large inventory of bikes, parts, accessories and clothing so that we may keep our customers cycling no matter what type of riding, season or problem they may encounter. Located downtown in the Historic Terminal Building.